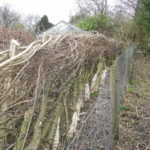 Hedgelaying: How Much is a Skill Worth? A well chosen hedge which is ready for laying and not over-grown (these can be difficult to find). Bishopston recreation ground’s hedge is at the right age for being laid (x-y years). Your work will be on display to the whole community so we will keep the standard of work high. The instructor takes on this responsibility. Have a range of quality tools to work with; we have a comprehensive hand tool collection which requires maintenance and storage. These are all overheads the charity pays for all year round. Enough time to practice, in a small group so the learning sinks in! Some hedge laying courses run for one or two days, we would describe this as more of a ‘taster’ but we have found a minimum of four days are required for the average student to become proficient enough to take on a hedge by themselves. This is the objective of the course, autonomy and confidence to get out there and hedge lay! The charity is happy to assist unwaged or unemployed students to take part. So anyone interested who cannot afford the full price is welcome to talk to us. However the charity relies on students paying the full price because £50 per day per student is what it actually costs the charity to put the course on. 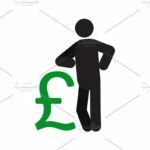 We have no external funding and rely on course fees to pay the overheads. 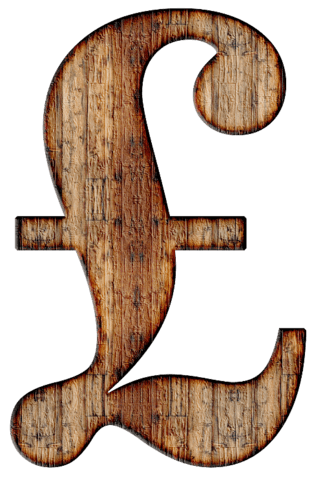 We believe this should be financially sustainable because if it is we can repeat courses rather than it being a one off. We are about building relations with the community and being of service to it but we need to pay our overheads. 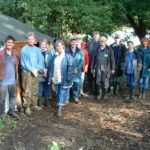 Climate and Community has been established and motivated by care and concern for the environment and are looking to connect with those in the community to teach demonstrate and facilitate best practice in maintaining and sustaining the environment. We believe a key issue in addressing problems such as the warming climate is to evolve new economic arrangements that make it possible for people to work in harmony with nature. This means equipping them with the right skills and knowledge.